At one point, Patinkin saluted the man in the audience responsible for putting him together with LuPone, Jeff Hunter, his agent who talked him into leaving a rehearsal at The Public of Des McAnuff's Leave It to Beaver Is Dead early and audition for Evita. The rest is history — and an unthought-of musical career. At the curtain call were a couple of sentimental surprises. Patinkin and LuPone presented their bouquet of flowers to their lead producer, Staci Levine, who has run their tour (and his life) and who suggested a Broadway stop. Then, LuPone called to the stage her son, Josh Johnston, and had the audience sing him a happy 21st birthday. It made an adorable mother-son moment for all. After the show, the merriment moved directly across the street to the Glass House Tavern, where upstairs the birthday cake was cut and distributed while mom and Mandy met the press downstairs. 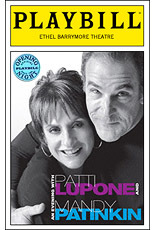 LuPone agreed, with italics, that the show was an easier delivery than she had 21 years ago. "Josh had no idea," she hooted happily. "We brought him backstage. Staci brought him back and said, 'You gotta get out of these clothes.' He said, 'Get out of these clothes? Why?' He had no idea we were bringing him up on the stage." Her next professional mountain hasn't a note in it, she was pleased to say — The Anarchist in the fall, a two-character play written and directed by David Mamet. She's to play a longtime prison inmate with ties to a violent political organization who pleads for parole from the warden (Laurie Metcalf). "It's a very difficult play, and it's a very powerful piece — and I am thrilled to death that David and I are back together again. This makes the seventh production I've been in. I go back to The Woods. I go back to All Men Are Whores in 1975. I was hoping my relationship with David wouldn't end with The Old Neighborhood, and it's not. He has written two very powerful women in a powerful piece. I wanted it. I think I willed it." Patinkin is heading down a musical path — two musical paths: "Let Go is a new piece I've created that I'm going to give birth to in February. It's a 112-minute song cycle — sort of a generic family album, both a generic family and the family of country. We have a week-long booking in Florida, I can't remember where. "Then I have a new show that I'm putting together with Taylor Mac, called The Last Two People on Earth. We're both in it, and we're both creating it along with Paul Ford. It's all music. I have one-third left to learn of it in terms of the basic skeleton, and once I get a break, then I'll start drilling that material into my head, then we'll start roughing it out, trying it out — and it will tell us what it needs." For the show at hand, Patinkin shares conception credit with Ford, his musical director since 1988, and the solo credit he takes for direction he doesn't take very seriously. "I'm a collaborative director. Really, we all direct it together. I can't do without Paul Ford, without Patti, without David Korins [production design], without Eric Cornwell [lighting design], Daniel Gerhard [sound design] — everybody directs it together. All my shows are like that. I'm not the director. I'm just the guy who makes everybody stay in the room and keep collaborating." An Evening With Patti LuPone and Mandy Patinkin, as Ford recalled, was the result of a manipulative lie, told to them to get them together to open a theatre in Richardson, TX, just outside Dallas. "They told Patti they had Mandy, and they told Mandy they had Patti. They lied — and here we are, just because of that lie." It was a lie worth pursuing, and a musical evening started evolving from it. "Mandy had the idea about South Pacific and Carousel — those two things — and then we had to fill in the middle. It was how many hits do we do or do we not do, and where do the Evita songs go — that's a whole book in itself." Patinkin filled in the rest: "They wanted us each to do 20 minutes and then sing a song together, but I hate those evenings so I was ready to blow it off. I said to my piano player, 'Can't we do a show that tells a story and goes on a journey?' And he said, 'Yeah,' and I asked Patti if she was game, and she said, 'Go ahead.' So Paul Ford and I put it together. Then we started tinkering with it. There was about a three- or four-year period where we were busy and couldn't do it. Then, about four years ago, we had time, and we started booking it all over the place and doing it and making changes. We've been doing this the past four years all over the world." The evening's guest-list was a reflection of Broadway's dark-on-Monday tradition: The Mountaintop's Angela Bassett was there with hubby Courtney B. Vance. 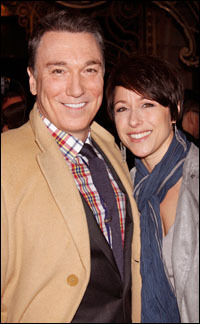 Spider-Man's Green Goblin, Patrick Page, was ground-bound and unharnessed, save for wife Paige Davis (his joke). Claire Danes was there but sans hubby, Venus in Fur's Hugh Dancy, who was executing an added Monday performance. And Bobby Cannavale was conspicuously stagging it, too, what with Anything Goes' Sutton Foster away, wrapping up a television pilot on the West Coast. Mrs. Page — yes, that would be Paige Page — has temporarily kissed the stage goodbye and got her own series on OWN, the Oprah Winfrey Network. "It's called 'Home Made Simple,' Sunday mornings at 11," she said. "I host it, and I bring in friends who are experts who work with families on solutions for their home." Over at her husband's Spider-Man Turn Off the Dark, the press vultures still hover. "The Associated Press ran a headline last week that said 'Actor injured himself in Spider-Man debut,'" Page related as a case-in-point. "Here's what really happened: It was Matthew James Thomas, who has been doing the show for a year, and it is his Broadway debut, but wouldn't you think that headline is slightly misleading? You would think it was the very first time he went on for Spider-Man. Then, how he injured himself was going downstairs to his dressing room and he hit his head on an overhang. And that made the headlines all over the world." Ah, media! "You really feel like you've seen an entire play of some kind, except it's deeper in a way and more profound because their friendship spans so many years." Balaban did a short film with Patinkin years ago, and they've been friends ever since; now, he's about to direct Mrs. Patinkin (the marvelous Kathryn Grody) in Falling Apart Together, a natural progression, 20 years later, of A Mom's Life, another one-person show she performed at The Public. Others in attendance on opening night were Lois Smith (the publicist), Nathan Gunn, producer Roger Berlind and wife Brooke, The Dodgers' Michael David and Lauren Mitchell, songsmiths Marc Shaiman and Scott Wittman, Venus in Fur playwright David Ives, Lucky Guy author Willard Beckham, the aforementioned Taylor Mac, working on a one-time-only 24-Hour Concert of The History of Popular American Music ("We're breaking up the decades first to workshop all the material, so once a month I have these concerts at Joe's Pub"), Jim Borstelmann, Sunday in the Park with George director James Lapine, R&H exec Ted Chapin and Morena Baccarin.